The night sky may be the most awe-inspiring spectacle that any of us will ever see. It can, however, be difficult to capture in a photograph, as it requires specialized techniques that are rarely used when shooting images during the day. Renowned photographer Grant Collier sheds light on how to capture these otherworldly images by sharing secrets he has learned over the past 12 years. He explains how to take photos of the Milky Way, northern lights, meteors, eclipses, lightning, and much more. Grant begins by reviewing equipment and supplies that are helpful when photographing at night. He then discusses many software programs, web sites, and mobile apps that will help you plan your shots. 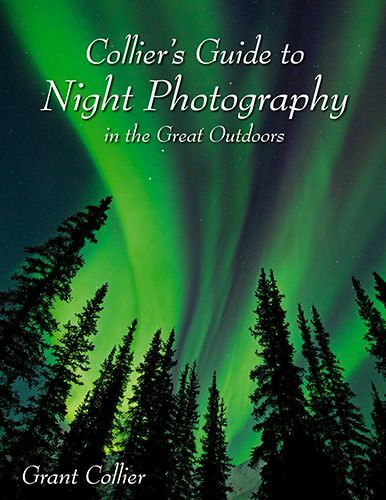 Finally, he offers extensive advice on how to capture and process images at night. He goes beyond the basics and teaches how to blend multiple exposures and create huge stitched images to capture incredibly detailed photos that you never before thought possible! - How to photograph the Milky Way, northern lights, eclipses, meteors, lightning, air glow, lava, and more! - What moon phases to shoot under. - Light painting the foreground and recommended flashlights. - Capturing star trails with both film and digital cameras. - Creating comet-like star trails. - Stitching huge images that can be printed very large. - Stacking images and blending multiple exposures to increase detail. - Focus stacking to increase depth of field. - Using an equatorial mount (or star tracker). - Enlarging star size to bring out constellations. - Minimizing noise, light pollution, and elongated stars in post-processing.